THE second annual Bristol NUJ Student Awards have just been presented to the winning contenders among the journalism students at the University of the West of England. Ellen Mauro, Kara Lewis and Chris Hanson each won a £50 prize for work which the Bristol NUJ executive judged showed the most professional promise. The awards aren’t for articles which might win the highest marks from UWE tutors, explained Bristol NUJ chair Paul Breeden at the prizegiving at the university’s Bower Ashton campus. Rather they are for pieces which show the student can identify a good story –and communicate it in a way which makes sense to the reader or viewer. Students at the prizegiving watched pieces to camera by Ellen Mauro – who won the MA prize – on stories ranging from a fatal crash in her native Canada to international news on Italian politics. Ellen won the NUJ prize, however, for a moving article in Bristol Globe magazine on Biniam Afawarq, a refugee whose long journey from Eritrea to Bristol saw him lose his mother in tragic circumstances. Ellen now works for Canadian broadcaster CBC in London. Kara Lewis – now working in New York as a freelance – won the third year for her lively article in Bristol Globe on Bristol Boxing Gym, an organisation which helps young people from all walks of life, from Muslim women to young people involved in gangs. Kara drew the reader in to a story full of hope for many communities. Chris Hanson was present to receive his award for a three-minute broadcast on Bristol’s congested public transport network and the measures being taken to improve it. 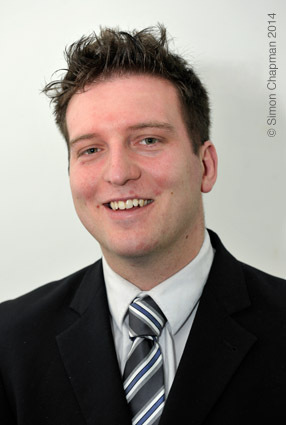 Chris was praised for the professionalism of his piece, which packed in several interviews with factual displays and well-paced camera work to produce work which would not look out of place on TV. Bristol NUJ congratulates all the winners – and we look forward to seeing this year’s entries, due soon. 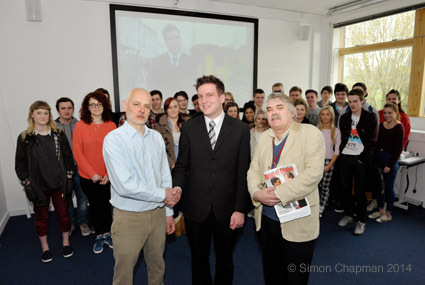 Front, left-right: Paul Breeden, Chair of Bristol NUJ; Chris Hanson, student prize winner; Mike Jempson, Senior Lecturer in Journalism. Chris Hanson, student prize winner. 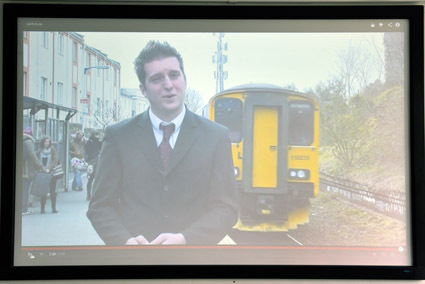 Chris Hanson, student prize winner, in his broadcast on Bristol transport.